Other dates are more associated with division. There’s always some excuse to fight over the “true meaning” of Christmas, Halloween and even Columbus Day. But while no one actively fights over it, no date reveals a greater divide than New Year’s. That divide is between people who look forward and those who look backward. As 2007 ends and 2008 begins, we spend most of our time looking back at the year that was: who died, events that shaped the world, Time magazine’s Person of the Year. We spend a good deal less time, it seems, looking forward to trends and issues that will shape the new year and years to come. If we spend more time looking backward than forward, that’s understandable. The past is easy. We usually know what happened even if we don’t know what it all means. The future, however, is unknowable. We can only imagine it. Still, even if predicting the future is more difficult than reflecting on the past, that’s no excuse not to give the future a try. Yes, as George Santayana said, “Those who cannot remember the past are condemned to repeat it.” History is important, obviously. But as The Amazing Criswell once said, “We are all interested in the future, for that is where you and I are going to spend the rest of our lives.” A phony, showbiz psychic has never spoken truer words. Looking forward, beyond the short run, doesn’t come naturally to us. In fact, it’s a recent phenomenon. Our hunter-gatherer ancestors didn’t have to look beyond the next hunt. And our agrarian ancestors, who came later, didn’t worry about much beyond the current growing season. As far as most people back then were concerned, the future was going to be pretty much like the past — awful. So, there was no point dwelling on it. That didn’t really change until the early 1800s, and with good reason. According to Gregory Clark, chairman of the University of California, Davis economics department and author of “A Farewell to Alms: A Brief Economic History of the World,” living standards remained basically stable — and low — from our hunter-gather days through the 18th century. It wasn’t until the Industrial Revolution got under way in the 19th century that living standards (for some) shot up, technological advancement exploded and life spans increased. Suddenly, the future mattered. In a big way. It’s no accident that the late 1800s saw the birth of science fiction, as seen in the works of Jules Verne and H.G. Wells. People now had to speculate about the long term. But before the Industrial Revolution could take hold, it needed the proper intellectual climate — one that fostered scientific discovery and entrepreneurship. That climate was the Enlightenment. From the late 1600s through about 1800, scientists, philosophers, historians and economists — people like Isaac Newton, David Hume and Adam Smith — pushed forward the boundaries of human understanding. This was as forward-looking a group of intellectuals as the world has ever seen. By enabling the progress that followed, they helped make the rest of us in the West forward-looking, too. Science fiction writer David Brin divides the world into forward-looking Enlightenment societies and Romantic societies, which look back to some long-ago Golden Age. Romanticism in the 1800s was a reaction to the Enlightenment and idealized a pre-industrial bliss that never existed. Today, America still has elements of both its Enlightenment and Romantic heritages. But it’s the ratio that counts. As we enter a new year, there is no better time to set out sights toward what is to come. We can indulge in nostalgia anytime. The past will always be there. But the future will be here before we know it. “Peace on Earth, good will toward men.” That’s what we say at Christmastime, and this year we’re getting it — on one front, anyway. We’re not hearing much about the so-called War on Christmas. That’s a pleasant change from last year, when the airwaves were filled with chatter about a sinister conspiracy that was supposedly trying to stamp out the holiday season. Instead, when I Googled the phrase “war on Christmas” this week, most of the recent discussions were about how all of the war talk had settled down. During the Dec. 12 installment of his Fox News Channel program, Bill O’Reilly, whose voice had been one of the loudest decrying the alleged secular assault on Christmas, declared victory. The War on Christmas was over, and his side had won. But really, how much has changed? I still see signs that say “Happy Holidays” and “Seasons Greetings” instead of O’Reilly’s preferred greeting, “Merry Christmas.” Isn’t that a sign that the war is still on? I suppose it would be, if people hadn’t been saying things like “happy holidays” and “seasons greetings” for decades, long before some people with nothing better to do decided those were fighting words. The closest thing I’ve seen to a real war on Christmas in the past year is a T-shirt with the slogan “I support the war on Christmas.” Of course, it was a joke. The people who made those T-shirts did so only to irritate blowhards like O’Reilly. Being a contrarian sort of person, I thought of getting one of those shirts for myself. But I decided I didn’t want to risk getting punched in the face. If there is anything I abhor, it’s violence against me. Anyway, as far as I can tell, nothing has changed. People are celebrating Christmas this year just as they did last year. Yes, there are the usual little spats over putting explicitly religious Christmas symbols on public property. The Catholic League, led by the country’s most easily offended man, Bill Donohue, released a list of about a dozen instances in which a town refused to place a Nativity scene on a city lawn or something equally trivial. Not that Nativity scenes are themselves trivial. They aren’t, and you can see them in front of churches far and wide, which is why one more in front of a courthouse or city hall doesn’t matter. People don’t need the government’s blessing to celebrate Christmas. But most people don’t get worked up about such legal battles, anyway. How do I know? Well, I’ve seen a lot of houses decorated for the season, and I can’t recall one that had its own Nativity scene. There were lots of plastic Santas and reindeer, though. And since the houses were in Alabama, you can’t tell me that a bunch of Christmas-hating secularists live in them. If people really did get agitated about the fact that you can’t put up religious symbols on government property, they’d protest by putting up their own — just as some students hold private prayer rallies to protest the fact that you can’t have officially sanctioned prayers in public schools. It’s not much of a war on Christmas when the vast majority of Americans go about celebrating Christmas as they always have. And guess what? That includes most secular humanists. Richard Dawkins, the British biologist and atheist who created a stir last year with his book “The God Delusion,” admits to loving Christmas carols. That doesn’t seem like much of a declaration of war, does it? After nearly a year of delays, the third installment of Alan Moore and illustrator Kevin O’Neill’s graphic novel “The League of Extraordinary Gentlemen” has finally arrived on bookstore shelves. For those of you just coming in, the first two volumes followed a team of Victorian-era “superheroes” brought together by the British government to fight such dastardly evildoers as Dr. Fu Manchu and Sherlock Holmes’ arch nemesis Professor Moriarty, as well as a Martian invasion. Hollywood turned the first volume into a dreadful movie, but the less said about that, the better. Picking up about 60 years after the second volume, the third installment, “The Black Dossier,” follows rejuvenated League members Mina Murray (from “Dracula”) and Allan Quatermain as they sneak into 1950s England to steal a top-secret history of the League’s various incarnations throughout the years. Whereas the first two volumes feature numerous out-of-copyright characters drawn from Victorian literature — notably, in addition to Murray and Quatermain, the Invisible Man, Capt. Nemo and Mr. Hyde — “The Black Dossier” includes thinly veiled versions of characters still owned by various corporations and estates. Some are fairly obscure, especially if, unlike Moore, you didn’t grow up watching British television and reading British adventure magazines. Others, like James Bond and Emma Peel (“The Avengers”), while not named as such, are impossible to miss. And, it’s putting it mildly to say this is probably the most unflattering portrayal you’ll ever see of Ian Fleming’s bruising, boozing, womanizing super spy. It’s the presence of Bond and other fairly recently literary, film and TV characters that has gotten this installment into trouble. DC Comics refuses to publish it outside the U.S. because of differences in international copyright laws — not to mention fear of litigious copyright lawyers. And that has led to the most recent dust-up in Moore’s long-running feud with DC. So, Moore is taking his next volume of “The League,” scheduled for release next year, to Top Shelf Productions. Of course, if copyright law had been as expansive 100 years ago as it is today, a series like “The League of Extraordinary Gentlemen” wouldn’t have been possible at all, and writers like Moore wouldn’t be able to draw upon our shared literary heritage in order to tell new stories. Whenever the copyright term on characters like Mickey Mouse and Superman comes close to running out, companies like Disney and Time Warner, which owns DC Comics, rush to Congress for an extension. Characters and works that should enter the public domain — long after their creators have died — remain under copyright, where the rest of us can’t touch them. A century from now, a future Alan Moore won’t have the option of creating his own league composed of, for example, Jack Ryan, Anita Blake and Hannibal Lecter. That will be a major loss for popular culture. Meanwhile, Moore is far from the only author to find new stories for old characters. British novelist Kim Newman draws upon Sherlock Holmes and Victorian novels like “Dracula” and “The Island of Doctor Moreau” in his 1992 novel “Anno Dracula” and its sequels. And no one gets more miles from Victorian literature and early 20th century pulp magazines than science fiction writer Philip Jose Farmer. Through numerous books and short stories, Farmer has crafted a fictional universe that includes Tarzan, Doc Savage and, of course, Sherlock Holmes. Everyone loves Sherlock. But unless Congress finally says no to Disney and the rest, the worlds of Moore, Newman and Farmer may be the last in which fictional characters from all over can get together for one big literary party. If you read the letters to Santa that appear in this and other newspapers, you’ll notice that Christmas gifts are a lot cooler than they were years ago. One letter last week was from a child who asked for a Wii, an Xbox and, just so all bases were covered, a PlayStation 3. Good luck with that. When I was about that child’s age, way back in 1982, I asked for a state-of-the-art ColecoVision game console. Instead, I got an Atari 2600, which was already obsolete, having been replaced that same year by the 5200. I was scarred for life and haven’t owned a home video game system since. Yes, I’m bitter. But it could have been worse. Much worse. At this time last year, I was browsing the videos at YouTube and came across decades-old TV commercials for what can only be described as the worst Christmas gifts ever. Mostly, I blame Ron Popeil. Before the inventor/pitchman took up residence on late-night TV, using infomercials to sell food dehydrators and pasta makers, he was the man behind such contraptions as the Pocket Fisherman and the Inside-the-Shell Egg Scrambler. Maybe the Pocket Fisherman was a good idea. But how lazy do you have to be to want to scramble your eggs before you crack open the shells? One of Ronco’s biggest sellers was the Smokeless Ashtray. Now, when I was 6 years old, I didn’t need a Smokeless Ashtray. So, I got one for my dad. Yes, I know. I should have gone with the Pocket Fisherman. The problem with the Smokeless Ashtray was that it sucked up cigarette smoke only when the cigarette was in the ashtray. As I’ve since learned, cigarettes don’t spend much time in ashtrays until after they’re snubbed out. It occurs to me now that the Smokeless Ashtray was the perfect really, really cheap gift for a child to give to a parent. When young children buy gifts for parents, it’s definitely the thought that counts because children don’t have any money. So, it doesn’t matter that the gift is crap. My favorite Ronco product, however, was Mr. Microphone. All you had to do was set a radio to the appropriate frequency, and Mr. Microphone would beam your voice into the radio for all around to hear. As seen on TV, Mr. 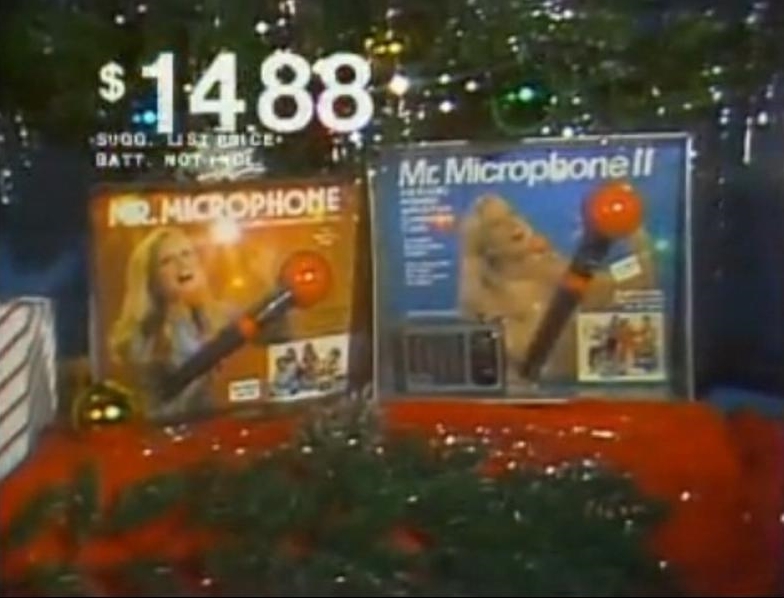 Microphone was a great way to pick up women, who were suitably impressed by guys who could ask them out via a car stereo. As seen in real life, Mr. 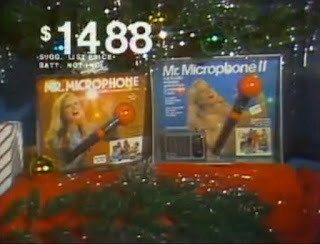 Microphone was a poor man’s karaoke machine, provided you could sing a cappella, which defeats the purpose of karaoke. But Ronco wasn’t solely to blame for the metaphorical lumps of coal in people’s stockings. Consider the Chia Pet. Amazingly, Chia Pets are now cool, in a kitschy sort of way. But in 1982, when the first Chia Pet appeared in time for the Christmas shopping season, they were just lame. Giving someone cheap, animal-shaped pottery that sprouts weeds was a sincere expression of hatred. Still, I get a little nostalgic when I think of the commercials that ran in the early 1980s for Underoos, the children’s underwear that came in designs based on Superman, Wonder Woman and other popular superhero characters. The commercials featured prepubescent children wearing only their Underoos and thanking the aunts, uncles and grandparents who gave them such great Christmas presents. You know, now that I think about it, those Underoos commercials are really creepy.